Ladies, join us the Saturday before Mother’s Day, May 11th at 2PM, for a Women’s Tea! All ladies are welcome, 4 years old and up! Come in your best tea-time attire (hats are welcome!) for lots of fun fellowship and a special time of encouragement! If you plan on attending, please bring something sweet and something savory to share! For any questions, please contact Kathy Lambros at 520-403-0032. Join us this Friday, April 19th, for our annual Good Friday service! ANYONE AND EVERYONE is invited to join us for this time of singing and scripture reading. Children are invited to remain with us in the service. You are invited to join us as our community groups gather together every Wednesday in February for our annual EQUIPPED course! This year Tim Lambros will be will be teaching through “Community Groups - A Forgotten Means of Grace” Check out the schedule below! Ladies, I hope you’re cleaning out your closets, because we are so excited to host a Women’s Clothing Exchange and Brunch Fellowship on Saturday, January 26th, at 10am here at Sovereign Grace Church. This event is open to the public, and even if you don’t have any clothes you’d like to exchange, please feel free to come, “shop”, and fellowship! There will be a pot-luck style brunch served, so please bring your favorite item to share. The church will be providing the coffee and tea! For any questions regarding this event, please contact Kathy Lambros at 520-403-0032. Interested in becoming a member of our church? CONNECT is a class taught by Tim Lambros that will go more in-depth into our beliefs as a church and the seven shared values we share with other Sovereign Grace Churches around the world. If you're interested in becoming a member of our church, this is the first step! OUR NEXT CLASS IS SATURDAY AUGUST 25TH. TIME AND LOCATION, AND FURTHER DETAILS REGARDING THE CLASS ARE STILL TBD AND WILL BE GIVEN TO ANYONE WHO SIGNS UP! Join us for our monthly prayer night, Wednesday, August 22nd at 7PM here at the church! Join us for our monthly prayer night, Wednesday, June 27th at 7PM here at the church! Join us for our monthly prayer night, Wednesday, May 23rd at 7PM here at the church! Join us for our monthly prayer night, April 25th at 7PM here at the church! This past week marks 18 years of being a church! Isn't God good?! Let's celebrate God's kind faithfulness to us as his body together at Riverfront Park after the service this Sunday! Don't forget to bring your own lunch, lawn chairs, lawn games, and sunscreen! Friends and family are welcome! What are you doing for Easter this year?! We would love to have you join us this Sunday as we celebrate the resurrection of our Savior Jesus! Our service starts at 10:00AM! Our address is 1241 W. Ina Rd. Tucson, AZ 85704, located on Ina between La Canada and Oracle! Come join us for our monthly prayer meeting, Wednesday March 28th, at 7PM here at the church! No sign-up necessary, but we would love to hear from you if you have any prayer requests! Join us the first and third Wednesdays of February and March as we take a closer look at what the Bible says about and how the Gospel should inform our sexuality! Meetings will start at 7PM, but come early for snacks and fellowship! Come join us as we gather to pray together as a church, Wednesday, February 28th at 7PM! Let's start the new year on the right foot with a New Years Day Roll! Join us January 1 at 10:00 am at Catalina State Park! 1. A family fun ride for families to do together, 1-3 miles and will remain in the state park. 2. A road bike group, riding on The Loop and in Rancho Vistoso. 3. And a mountain bike ride that will utilize the 50 Year Old trail. After the ride, we will provide hamburgers and hot dogs at the Gila group site from 12:00-2:00 pm. There will be games to play if you only want to do a portion of a ride and come back and hang out till lunch starts. If you plan on joining us, please bring something to share as a side (chips, cookies, salad, etc). If you and your family and guests plan on attending, please let Ernie Phillips (520-780-9198) know so we can provide enough food! 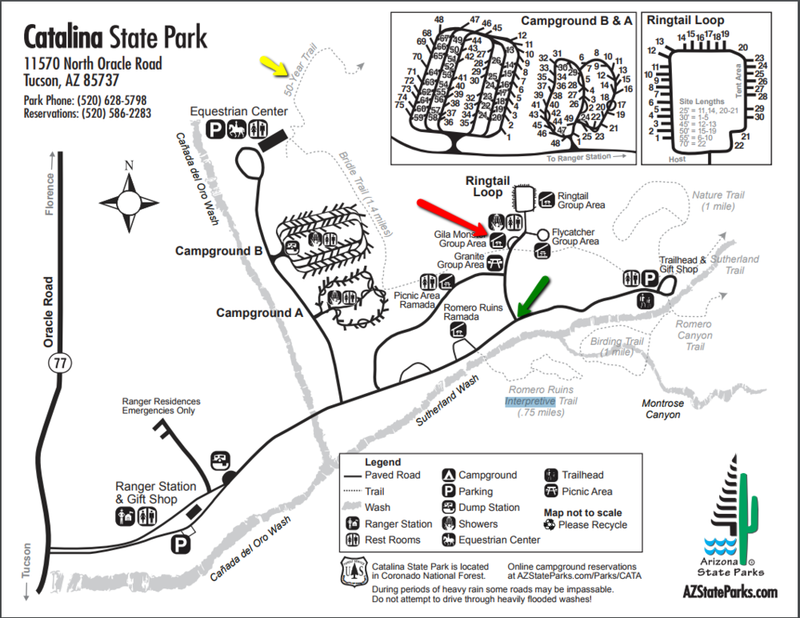 PLEASE NOTE that it is 7 dollars per vehicle to get into the state park (up to 4 adults per car and as many kids as you can fit!) Please bring helmets and sufficient water for the ride for you and your family! The red arrow indicates where we will meet and grill and play games. Green arrow indicates where the family ride and road rides will be riding on. The yellow arrow indicates where the Mountain Bike group will be riding. You and your family are invited to our annual Christmas Candlelight service on Christmas Eve, Sunday December 24th at 6:00 PM. Everyone is welcome! Join us Christmas Eve at 10:00 AM for our Sunday morning service! Come early for free fun seasonal refreshments and a family Christmas photo op, followed by an especially festive service as we celebrate the birth of our Savior! Everyone is invtited! There will be pastries and water provided! We will have an adult game and a game set up for the kids as well, so bring the whole family! JOIN US FOR OUR FIRST EVER TURKEY ROLL as we gather together to bike, enjoy some fun fellowship (share in that mutual need to work off all that turkey! ), and who knows...maybe engage in a little competition! We will be riding out from Riverfront park at 8AM so please be there and ready to ride at the latest by 7:45AM! 2. Continue on to the YMCA before heading back to Riverfront Park for a 20-25 mile ride total. Come join us as we pray together on Wednesday, November 22nd. Children welcome! As you all know, we are excited to have the privilege of holding yet another bi-annual Church in the Community Event at Riverfront Park on Sunday, November 5th at 10AM! We want to encourage you again to be considering who YOU can invite to join us! WHOMEVER you invite, let's be praying for opportunities to share the love of Christ in the Gospel with our community through this event, and for the hearts of everyone who participates with us! REMEMBER, because we'll be having our service in the park that day, our building will be closed! Our service will start at 10AM, but come early to enjoy coffee and donuts and sweet fellowship! Hey, maybe you'll even have the opportunity to talk with someone new in the park! Please be sure to bring your own shade, chairs, picnic blankets, and sunscreen for our service and subsequent activities! BRING YOUR DOG! We're encouraging people with dogs at the park to join us, and this might be one great way of connecting with people in our community! Come join us as we pray together on Wednesday, October 25th. Children welcome! Join us for a fun FREE Summer Community Event! JOIN US FOR OUR FOUR WEEK CORPORATE STUDY, "BUILDING A COMMUNITY OF COUNSELORS", TAUGHT BY PASTOR AND CERTIFIED BIBLICAL COUNSELOR FROM OUR CHURCH IN GILBERT, AZ, TREY RICHARDSON, EVERY 1ST AND 3RD WEDNESDAY OF FEBRUARY AND MARCH. CLASSES WILL BE HELD HERE AT THE CHURCH AND EVERYONE HIGH-SCHOOL AGE AND OLDER IS WELCOME TO JOIN US. Childcare will not be provided (see your Community Group leader for further details). Materials and refreshments will be provided. Join us for a leadership weekend here at the church Friday, January 27 from 7PM-9PM and Saturday, January 28 from 9AM-2PM. Wives are welcome to come! Food and materials will be provided so please RSVP on our main event page H E R E.